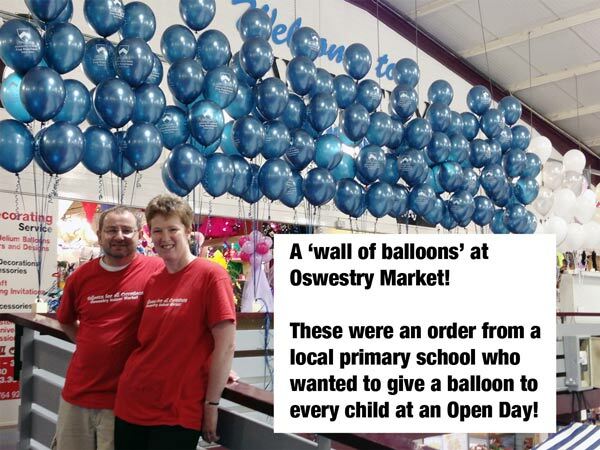 Balloons for all Occasions is a well established Oswestry business. For more than a dozen years, we have been supplying both individuals and local businesses with balloon decorations and partyware for parties and special events and functions. Over those years we've managed to blow around 70,000 balloons! The store is based in Oswestry Indoor Market, which is open three days a week on Wednesday, Friday and Saturday. Decorations can still be prepared and delivered outside of those dates. We are a One Stop Party Shop, and you’ll find much more than balloons when you come for a visit! If you’re looking to decorate the big day, we offer experience and quality, working with you to ensure it looks as stunning as you’d hoped. All of our latex balloons are professionally treated with a Hi-Float solution that will increase their flying time and ensure they remain in peak condition for when you need them. The last thing you need is balloons that start drooping through the day so, wherever you get them, ask to ensure they are pre-treated with Hi-Float! Whatever your event, it’s important to take time to plan it right. We can work with you to take your ideas and bring them to life, so come into the store for a chat. Even better, call ahead and we can arrange to make sure you have our full attention!